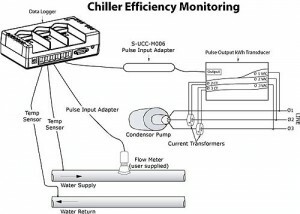 The first step in improving chiller operating efficiency is to monitor current conditions (kW/ton). Monitoring water supply temperature and flow rate, water return temperature, and power draw of condensation pumps can easily be accomplished with the Energy Logger system. Note: A third party flow meter is depicted with pulse output. The Energy Logger can also accommodate analog inputs with the use of the FlexSmart Analog Input Module P/N S-FS-CVIA.